Disk Checker is a full-featured disk diagnostics and repairs tool with backup ability. The program runs under Windows 95/98/ME/NT/2000/XP/Vista. Disk Checker includes two separate methods of disk checking: using file-access or direct access to disk surface. The direct access method is much faster and is perfect for large number of small files. The Disk Checker can report not only defective sector number as well as the file name they belong to. Removable (floppy, ZIP, ORB, JAZZ, etc), hard and CD-ROM disks are supported in direct access method (you must have administrator rights for checking hard disk under Windows NT/2000/XP). For above cases as well as for remote disks, RAM disks and network drives you can also use the file-access method . You can use this program for backup purposes as well. Disk Checker can create disk images compatible with disk image files produced by other disk copy utilities (Diskcopy, WinImage, DiskDupe, etc), including burning CD-ROM image .ISO files. Disk image is a file that contains all the disk data, such as boot sector, files and folders structure. It is possible to read or write disk image and format disk. Also you can see S.M.A.R.T. attributes for your HDD. 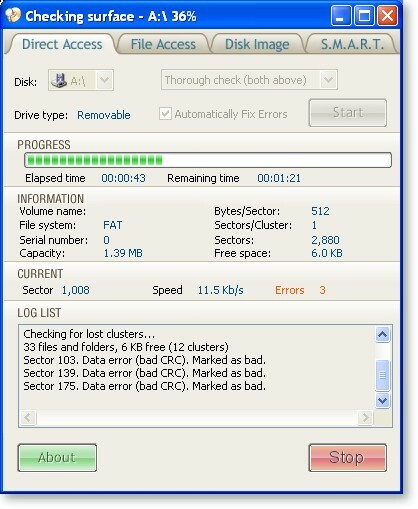 This feature predicts HDD failure, which will help to avert data loss. Command line, logging and dedicated item in Windows shell context menu are supported. 1 In file method you can check network folder by using uniform naming convention (UNC). For example, you can include something like the following: \\COMPUTER2\PUBLIC. You can select network folder with Browse button. 2 You must have administrator rights for checking hard disk under Windows NT / 2000 / XP. Screenshot of Disk Checker. Checking disk A: with direct method. Then please see other screenshot here (checking Public folder on FISHER computer with file method). Anyone may use this software during a test period of 30 days. Following this test period of 30 days or less, if you wish to continue to use Disk Checker, you need to register. The registered users will use all following versions FREE. This software purchased by users from Australia, Austria, Bahrain, Belgium, Brazil, Canada, China, Denmark, Ecuador, Estonia, France, French Polynesia, Germany, Hong Kong, Ireland, Israel, Italy, Luxembourg, Mexico, Mozambique, Netherlands, New Zealand, Norway, Panama, Portugal, Russian Federation, Singapore, South Africa, Spain, Sweden, Switzerland, Taiwan, Thailand, United Kingdom and United States. If you found 3 small bugs or 1 critical bug in this software then you will get a registration code FREE. Other ways of registration (via phone, mail or fax).